I’ve been looking forward to working on this banjo ever since it was suggested to me…and now with the Hound’s ears well underway, I’m going to turn a bit more attention toward it. 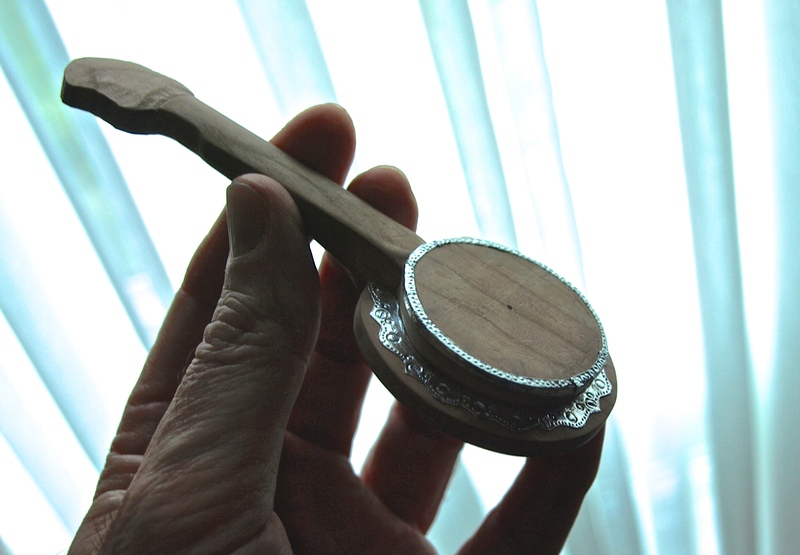 You’ll remember from an earlier post that I used a bandsaw to carefully cut out the basic shape of a banjo from a piece of oak. 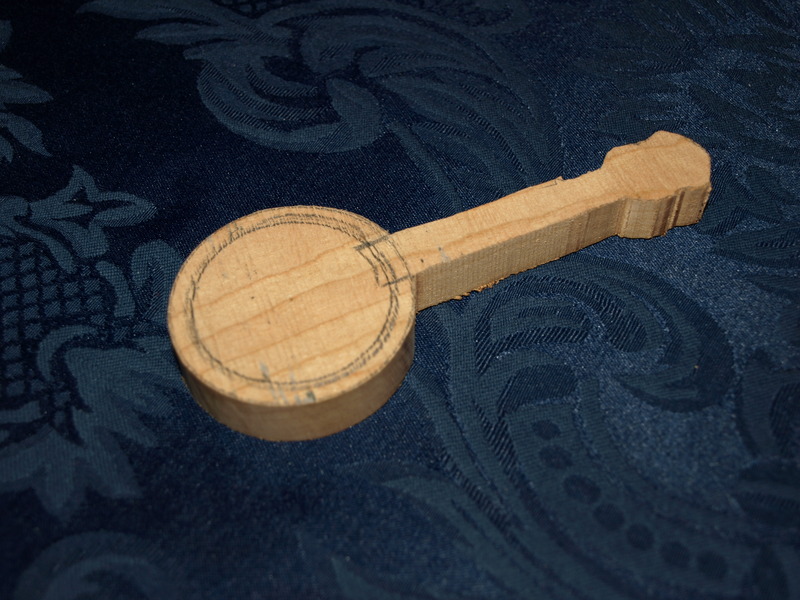 With that rough out, I did a bit of carving, but mostly sanding to get it to the shape that I imagined. This will be a five string banjo, which means that four of the mechanisms ( ears ) will be on the head of the banjo and one mechanism will be on the neck. If you look close, you can see that I made a little indentation on the neck to fit that fifth mechanism. Now, comes the fun part. I want to put in a lot of metal looking parts on the body of the banjo in particular. 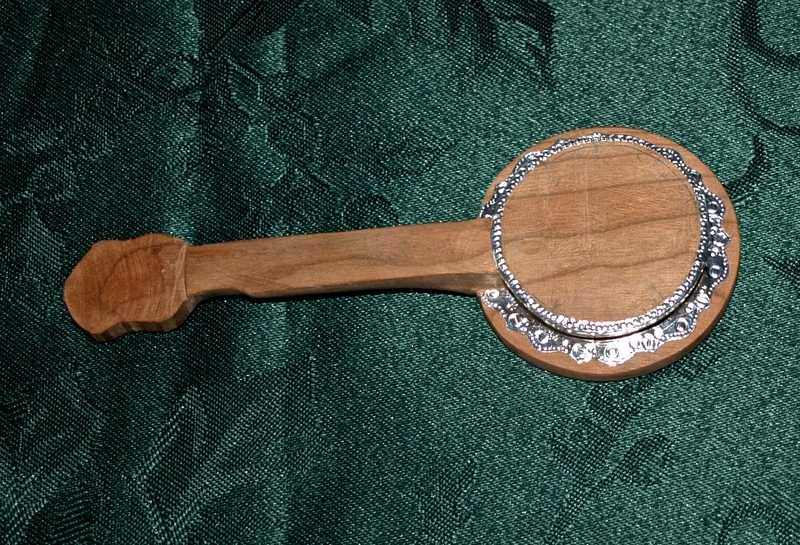 If you take a look at a picture of a banjo, you’ll notice that one style has quite decorative “tin” around the stretched banjo skin and is held together, or tight, with long-ish bolts. This is the look that I’m after. So, I’ve first started with the tin pieces. My version is made with metal tape that you commonly see used on ductwork. This is an aluminum tape with a strong adhesive back. One nice thing about the tape is that it can be burnished ( rubbed ) with a tool to flatten out completely and to some extent accommodate small curved sections. The other nice thing is that it can take an impression by pressing into it. So, with the tape in hand I went about creating what I’ve seen on some of the banjos that I like. After the burnishing, I used a few small tools that I had lying around to make little impressions that look like screw heads and the general decorations that you see on a full sized banjo. Still a long way to go, but I like the way that it’s turning out so far…and, it’s fun. My goal is to be able to play at least one tune on it before handing it over to the little hound. 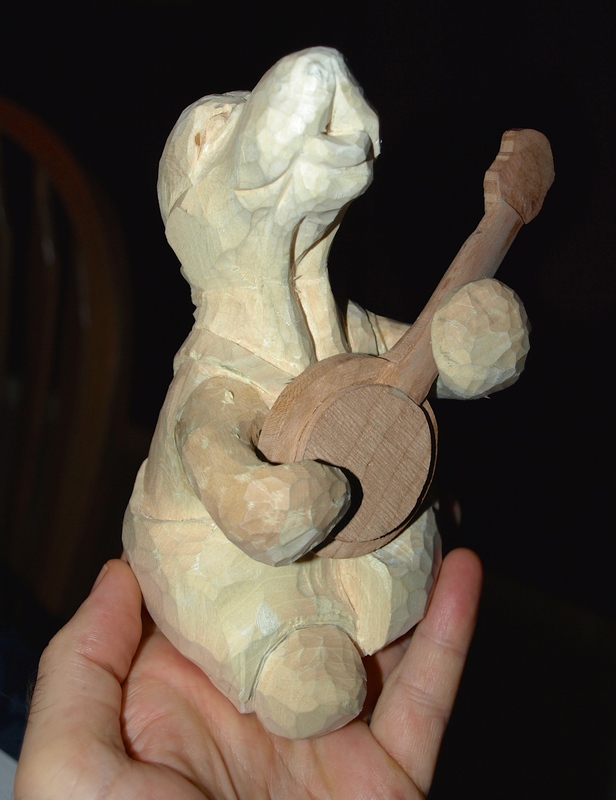 This is going to be one cool country hound,I love all the detail you are putting into the banjo too. I can’t believe that’s aluminum tape. Awesome! I really enjoy seeing all the cool details and tricks of the trade you use in your carving. Banjo is really looking good. Thanks everyone. I knew that I was going to enjoy making the banjo and I am. Maybe this is the beginning of just carving musical instruments…or a new focus on a whole band thing for me…maybe a caricature of the Rolling Stones performing! Does Mick have a Basset Hound, though? I like where your going with this a Basset with Jagger lips and swagger.